Try your hand out on a few of these raw vegan salad recipes and spruce up your normal raw food diet. These salads are varied with so many colors, textures, tastes, and ingredients. If you haven't yet fallen in love with eating raw salads, you will after trying a few of these raw vegan recipes. 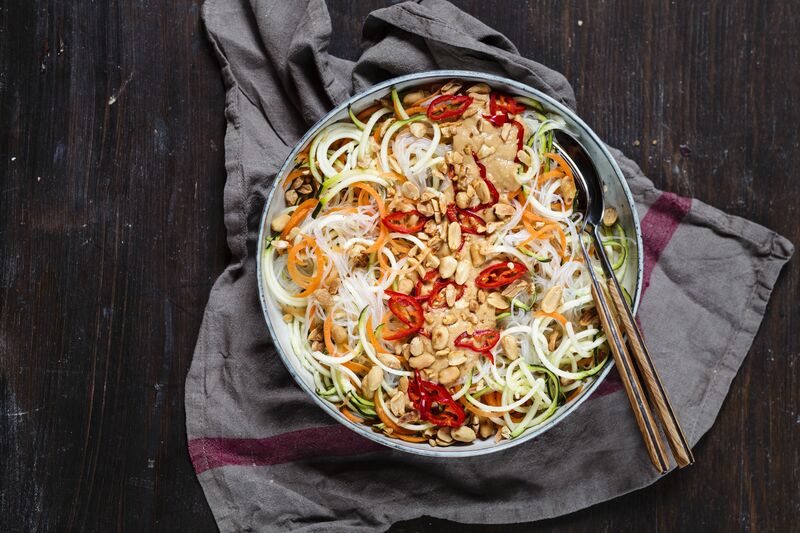 With bean sprouts, thinly sliced zucchini, and bell peppers instead of noodles, this raw salad is inspired by all the flavors of a greasy pad Thai noodle dish. A handful of peanuts, a squeeze of lime, some fresh cilantro, and a dash of sea salt round it out. It tastes just as good as it looks! Three Indian spices, raw flaked (or fresh grated) coconut and a touch of Nama Shoyu turn a simple cabbage cole slaw salad into an exotic treat. To turn this raw salad into a main dish, you might try adding a handful of raw soaked nuts, perhaps cashews or peanuts. Make this salad in advance to give the flavors plenty of time to fully develop. All of the tastes are represented in this salad—there's a bit of Nama Shoyu for a salty taste, some honey to make it sweet, fiery Thai chilis make it as spicy as you can handle, and a generous amount of lime makes it sour as well. Use a mortar and pestle to smash it all up together the way they do in Thailand. It really is best that way. Dressed with a tahini-based raw Goddess salad dressing, this Waldorf salad takes after the real thing and has traditional Waldorf salad ingredients such as carrots, nuts, cabbage, and apples. Instead of the usual Waldorf raisins, dates make a nice substitute in this raw salad recipe. Make and dress this salad ahead of time in order to soften up the cabbage and carrots. This one will likely become one of your favorite raw vegan salads. Want to learn more about raw foods or try more raw food recipes? There are hundreds of raw food recipes for salads, soups, entrees, and of course plenty of raw food desserts to try!